Charles Eames specialised in creating furniture. His products have been considered iconic in the design world since the 1950s. 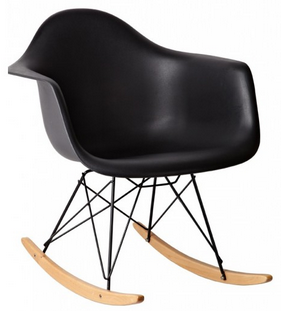 Charles Eames is admired for his originality. The American; a designer, architect and filmmaker, was born in Missouri in 1907. His career began when he studied architecture at the University of Washington in St. Louis, but he then started his own company to begin creating furniture collections with the help of his wife, Ray. Their real success began in the 1940s. The RAR (Rocker Armchair Rod) ABS Armchair is one of Eames' many renowned creations. This rocking chair was first presented in the Museum of Modern Art (MOMA) in New York at the beginning of the 1950s. It is distinguished by slightly curved beech feet that allow it to oscillate. The plastic body is supported by fine legs of stainless steel. With the RAR ABS Armchair, Charles Eames demonstrated how it is possible to combine modernity, elegance and simplicity. This product is an emblem of Eames' desire to create a chair that was both practical and stylish. Ideal both inside and in the garden, the ergonomic and comfortable design of this armchair allows you to relax without guilt. Today, numerous websites support the sale of Eames' famous RAR ABS Armchair.